We’re looking for Top Performers. Want your resume to stand out? Looking for a challenge? Apply today. DECO Windshield Repair was founded in 2005. They started with just two sites in Alberta, expanding to over 200 sites nationwide from Vancouver Island to Ontario. 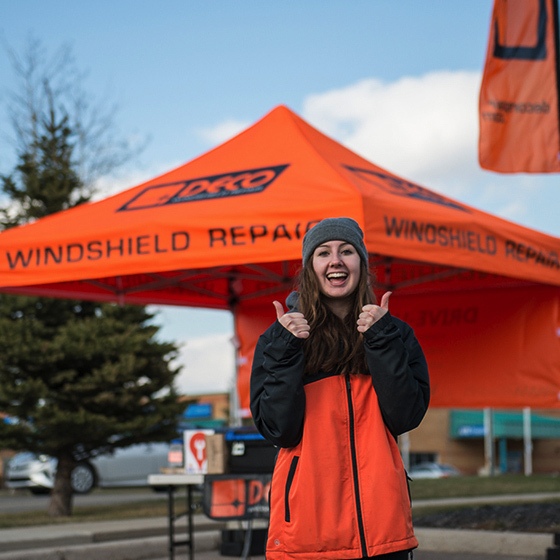 DECO Windshield Repair is run by our corporate head office in Calgary, AB, with the assistance of regional and city managers across the Provinces and Territories. In 2019, the company will continue to expand across Canada. DECO Windshield Repair has been recognized in Profit Magazine’s Hot Top 50 and Top 200, Alberta Venture Magazine’s Fast Growth 50, Calgary Business Magazine’s Business Leaders of Tomorrow and Avenue Magazine’s Top 40 under 40. Windshield Repair. Sales. Customer Service. Uncapped Income. Why do you work at DECO? 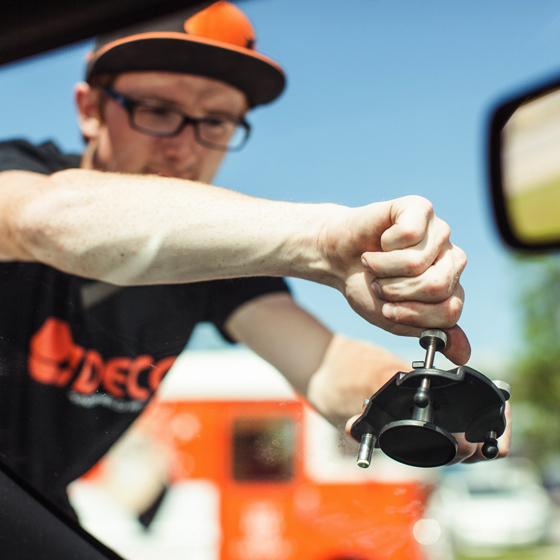 At DECO Windshield Repair, we believe in working hard and saving windshields. 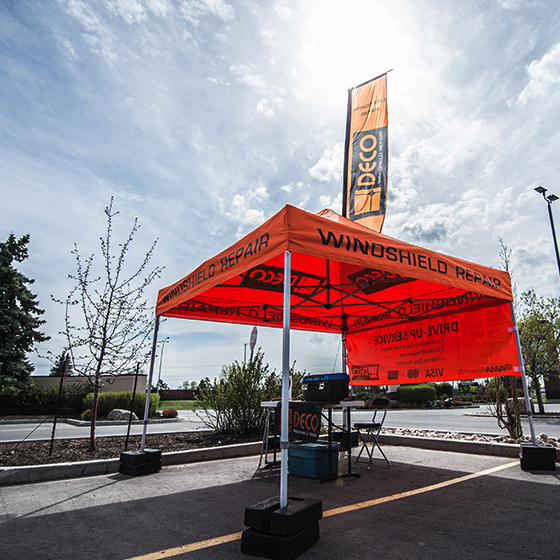 Every day, our Site Operators set-up their kiosk locations by 10:00AM and repair windshields until 6:00-7:00PM. Every customer is an opportunity to build rapport, achieve sales & showcase your windshield repair expertise. You will interact daily with a wide variety of customers from all walks of life. You’ll spend your time communicating with customers, repairing windshield damage, selling Repair Plans, and servicing our existing Repair Plan customers; all while providing the customer an unforgettable experience. The best part? You’ll be working outside all day in the sunshine independently running your own kiosk while still being part of a team. At DECO we offer a competitive compensation structure that rewards top performers, there is no limit to your earnings. You’ll earn a guaranteed base wage plus commission for all your new sales. The harder you work, the more rock chips you fix, the more days you work; the more you earn. Period. We hire just 1/50 candidates interviewed and search the country for top performers. 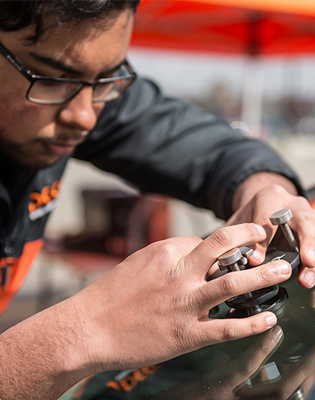 If you have a provable track record of commitment, thrive in a competitive environment and what to learn about windshield repair & sales, we invite you to apply. At DECO we believe in balancing hard work with fun! We’re a company that rewards performance and it’s our goal to create a fun competitive culture. 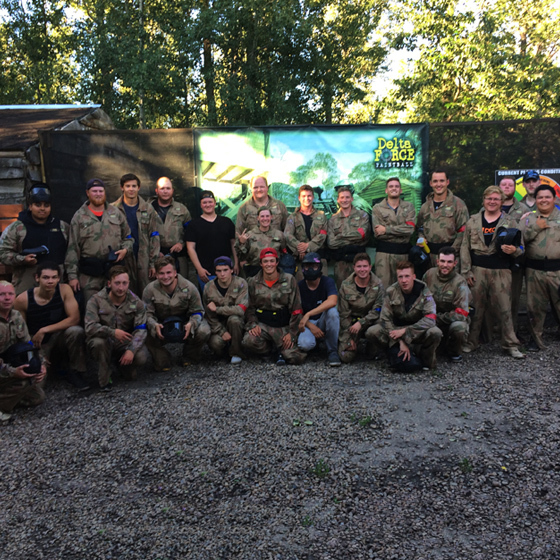 Throughout the season, we host monthly regional events such as BBQ’s, paintballing, river rafting, we get together for Calgary Stampede, we’ve even sent a few Site Operators to Mexico! Whether you’re saving up for a house, tuition, a vacation, or a new car, whatever it is, DECO wants to work with you to reach your financial goals. We have seen DECO-alumni take extended trips, support their athletic careers, buy a condo or pay for a full year of school with the money they made at DECO Windshield Repair in one season. 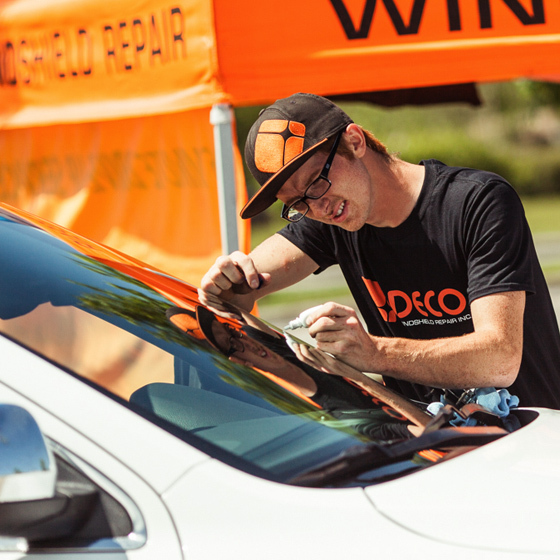 Are you qualified to join DECO Windshield Repair? Are you a top performer? Apply now. You do not need any previous windshield repair or sales experience. In every region across Canada, we provide extensive both on and off site where you will receive technical training in windshield repair, sales and customer service. The only requirement is that you have access to a vehicle to ensure you can transport your site set-up, equipment and repair tools. Complete the application below and we will contact you shortly! Do you only hire students? The majority of our Site Operators are students in a post secondary program. However, we are open to hiring grade 12 graduates for our Summer and Fall season and those not currently in school. Ideal candidates not currently in school might be on a work visa, saving-up to travel or looking for part-time work. Do I have to be enrolled in a Business Program? No. We hire students from different programs and facilities. The DECO Site Operators that perform best and earn the most money regardless of the school program are; confident, prefer to work independently, goal oriented, thrive when give responsibility and have previous customer service or sales experience. Can I work with DECO outside of April-October? We have select opportunities in cities across Canada to do commercial service work -and mobile repairs at customers homes or workplaces during the Winter Season. Do I need a car or can I take public transit to work? Yes, you need a car. A vehicle is required to transport your kiosk set-up, equipment and repair tools (flag, tent, table, stool, toolbox, rubbermaid) each day. Is DECO a franchise in certain regions of Canada? No. 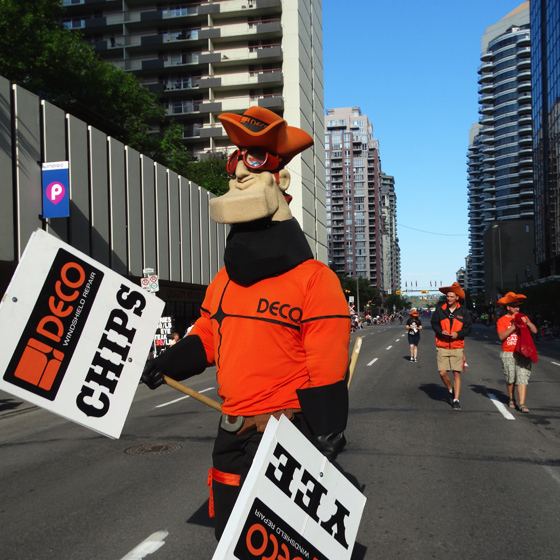 All DECO locations are owned and managed corporately from our head office in Calgary. We put on Regional training events across Canada in major cities. I can’t start work until June. Will that be a problem? No. While we prefer to hire students who have availability from April through October, we understand that not everyone’s schedule allows for that. If you are a great candidate, we have no problem with you starting later or finishing the season earlier. Attending the spring Regional training event is still required. Why would I work for DECO and not another windshield repair company? 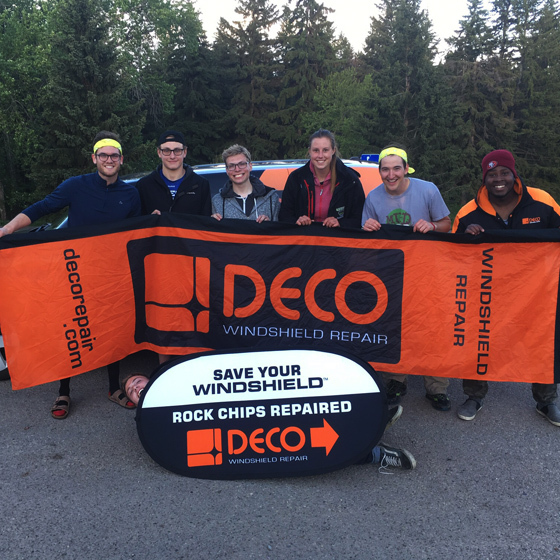 DECO Windshield Repair is North America’s largest windshield repair company and Canada’s Top Student Employer celebrating it’s 14th year in business. We’re most excited about our growing list of DECO alumni that have gone-on to launch their careers and be young leaders in communities across Canada in the past decade. We’re licensed with the Alberta Motor Vehicle Industry Council (AMVIC) and the Auto Glass Safety Council of North America. I’m a people person. Will I enjoy operating a site by myself? Absolutely. The average windshield repair or glass treatment takes just 15-20 minutes. You’ll see a lot of different people throughout the day for short amounts of time. In addition, using the DECO app and Slack on your company provided iPad allow you to communicate instantly with other team members and your manager. What is DECO’s stand on Corporate and Social Responsibility? DECO makes great efforts in this area. Let’s talk about the environment first. Since windshields cannot be recycled, thousands and thousands of windshields end up in landfills every year. 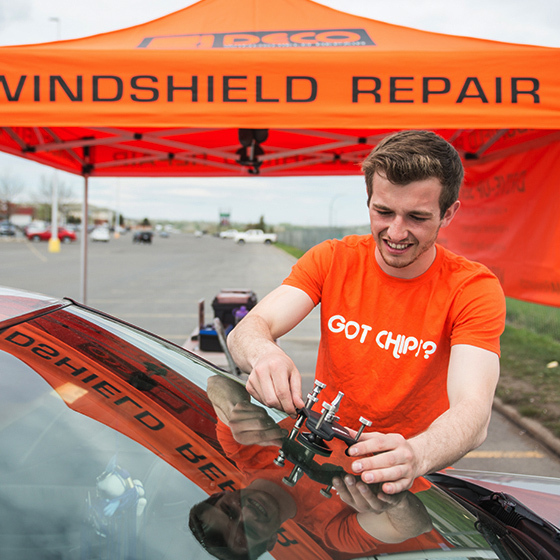 We aim to prevent windshield replacements by educating our customers on the importance of repairing a chip before it cracks out. We use as many biodegradable products that we can, we’ve eliminated paper with the iPad, switched our aerosol glass cleaner to the eco-friendly waterless carwash products and replaced paper towels with microfibre cloths. We also care about the communities we work in. We partner with charitable organizations by giving away prize packs and participate in as many community events as possible. Simply fill out the form on this website and a local Territory or Regional Manager will be in contact with you shortly.